One day Arthur Conan Doyle will create the greatest detective of all -- Sherlock Holmes. But right now Artie Conan Doyle is a twelve-year-old Edinburgh schoolboy with a mystery of his own to solve. While sneaking out to explore Greyfriars Kirkyard by night, Artie and his best friend Ham spot a ghostly lady in grey and discover the footprints of a gigantic hound. Could the two mysteries be connected? These strange clues lead them to a series of robberies carried out the sinister Gravediggers' Club and soon they find themselves pitted against the villainous Colonel Braxton Dash. Will Artie survive his encounters with graveyards and ghosts in the foggy streets of nineteenth century Edinburgh -- or will his first case be his last? 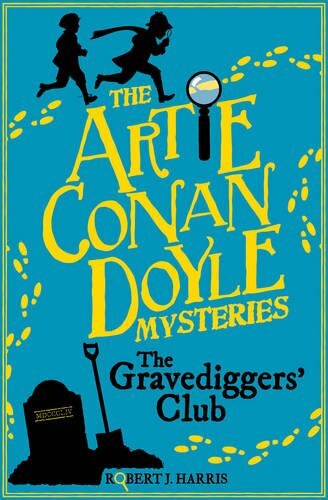 Robert J. Harris, author of the brilliant The World Goes Loki series, has now exploded onto the middle-grade fantasy scene with another new series entitled Artie Conan Doyle Mysteries. The first book in the series is "The Gravediggers' Club" which was published by Floris books on the 16th February 2017. As soon as you turn the page, you find yourself instantly transported back to 19th century Edinburgh, where it is swirling with fog, danger and a slight hint of bagpipes playing in the background. Welcome Artie Conan Doyle onto the stage with his friend and sidekick in tow, Ham.You will love Ham's laid back character and the way he deals with the danger and on-going adventure. He would rather be somewhere else where it is warm, safe and allows him to eat cakes, rather than a spooky graveyard late at night with a howling beast or a spooky apparition scaring him witless! As you'll be able to tell, he is very reluctant to engage in the mystery that suddenly smacks them in the face. The adventure follows Artie's suspicions around the young trainee doctor lodging at their house who is up to no good. It's a very easy-going story to follow with a mystery to solve. It is full of action and brings together an eclectic cast of characters to give it some Scottish charm. It reflects the time and period very well through the reality of sickness/poverty and the hardships family faced at that period in time. The setting and backdrop are very well written. They enable you to recognise aspects of the city as well as get a brilliant feel for the story. The villain of the story, Colonel Braxton Dash, has a great name but he did not quite live up to his reputation. In my opinion, he needed more dark deeds to heighten the tension and develop his character. A little extra side story would have turned this into a dark macabre story and made the reader sit up a little more and take notice. This is a very enjoyable detective story consisting of some brilliant dialogue. It has a fantastic ending which makes a good impression for the rest of the series.